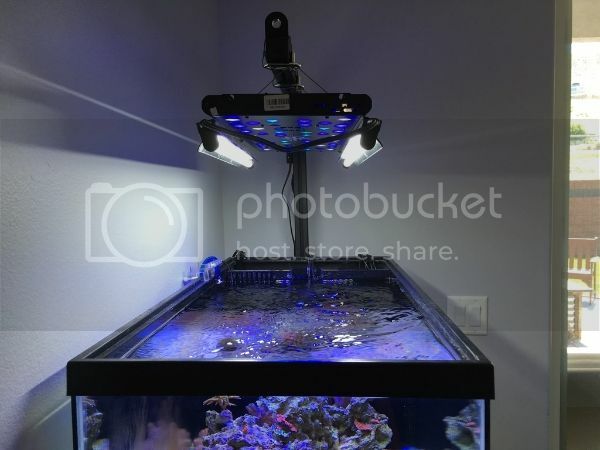 Guys, I need help figuring out how to add a couple T5 bulbs to this 24" Reef Breeder Photon V2. Please forgive the blue washout, my phone broke and I had to take pics with an iPad (blues were really low, tank looked super white). I want to buy an LET T5 retrofit kit and mount it to my fixture, but I don't know how to make it look sleek. I don't want a couple of end caps sticking out the ends of the reflectors. I'm very handy and have a shop with all sorts of tools to help me out. I just need a creative kick start from other reefers. 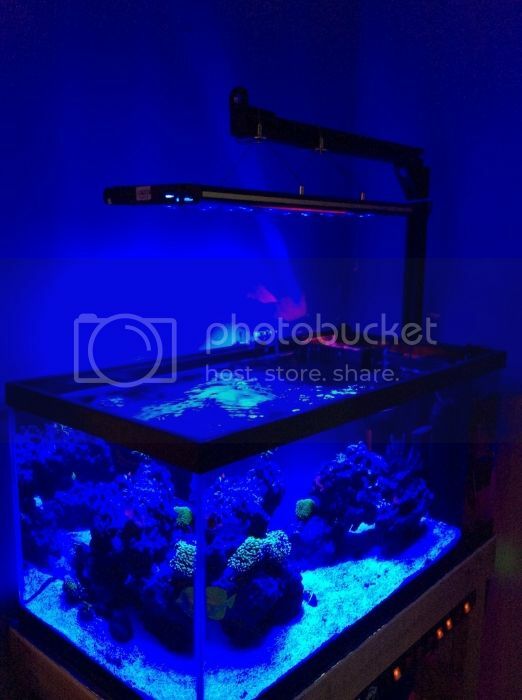 I'm also open to buying a couple "LumenBars" (high intensity LED strips sold on the Reef Breeders website) if I KNOW they'll give me the proper spread and coverage to grow acropora and other difficult SPS. Don't be shy to tell me which way you think would be best (just know that I'm leaning towards T5 because it's hard to argue with the results). I bought a Sunblaster Nano t5 which is a relatively good looking t5 fixture. It was my intention to try and hang it off the Photon V2 and keep it looking slim and classy. The fixture is quite nice but there are less expensive brands around that look very similar. I was unhappy with the light itself (not the fixture). The 6400K bulb that came with it was way to yellow. So I tried a 10,000K and then a 15,000K and I didn't care for them either. Too much white light, over powering the led cool white and seriously reducing the shimmer. 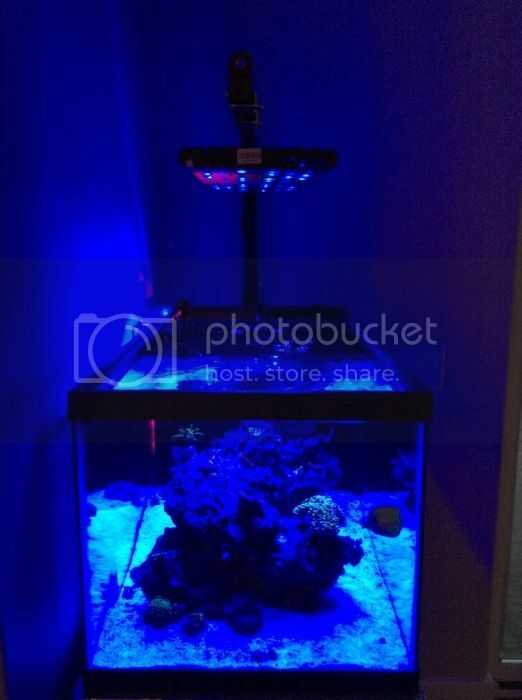 So I tried a retro fit t5/led bulb that is blue and UV so I could use it at the back of the tank. It looked good, but t5/led retro fit bulbs are hopelessly useless when it comes to PAR. It was terrible, something like 100 PAR at 3" in the air! And they are also crazy expensive, $70 for a useless 48" bulb! So I tried 2 led strips like the ones Logan is getting in, but from a different supplier. I wanted to wait for the LumenBars because I like how they fit on the V2. I'd have done 2 small ones in blue on the back side (I have a center overflow, so either side of it) and a full length white and blue one for the front. But they aren't available yet. So I looked elsewhere and picked up two 48" led strips, one all 445nm blue and one half 445nm and half 12,000K white. IMHO they look GREAT and did pretty much what I wanted. The front 1/3rd of the tank is a bit brighter, is still a cool white, still has shimmer, and shadows are reduced quite a bit. The back 1/3rd is quite blue, including the back glass that I have 5 corals growing off of about 1/2 to 2/3rds of the way up the glass. The V2 didn't light the back wall well as I had it pulled forward to try and reduce shadows under rocks and corals as seen from the front. The led strips cured all my issues, added some PAR and makes the 24" front to back distance look a bit bigger as the water gets blue toward the back. It's the kind of effect I see when I go snorkeling and look off into the distance. If/when Reef Breeders gets in a variety of LumenBars (both length and colors) I'll probably buy them and move the ones I have to a different tank that doesn't have V2 fixtures. The 2 'issues' I have with the led strips I bought are: 1) They have no fans and run quite warm... OK, almost hot. I can pick them up when they have been running at 100% (they have 2 channel dimming) but they wouldn't have to be much hotter and I'd need gloves or a pot holders! 2) The legs are OK if you keep them short (tucked inside the fixture). I need them fully extended and they become very flimsy and droop pretty dramatically. Lucky for me, I have euro braces and a screen tank cover they can rest on. BTW, the light side of the led strips isn't nearly as hot as the back heat sink side. I am considering taking the strips apart and making new, stronger legs, like the ones on the V2. So, do I find the time to do leg improvements before Reef Breeders gets an assortment of LumenBars for me to choose from? Tough call, I wouldn't put money on either side of that wager! BTW, you can see some before and after pics in my build thread. The link address is in my sig below. And the pics don't come close to showing how dramatic the change is in person. Cameras just struggle to deal with blue light in aquariums. Last edited by Ron Reefman; 06/29/2017 at 05:30 AM. Thank you for sharing your experience! Those Sunblasters look perfect for what I'm trying to do. They're cheap enough that I might just buy one to see how I like it, and then maybe buy a LumeBar if I choose to go that route. Again, thank you! And sweet build you got there! And after I bought the Sunblaster t5 I found out the hydroponics shop I got it from had a less expensive brand on the shelf that looked almost exactly the same. The Sunblaster was a special order and I had to pay for shipping which made it 35% more expensive! The reason for the extra light is NOT for PAR (did I emphasize that enough?). The Photon V2 puts out more than enough PAR for my 6' tank. I run mine at roughly 65% to 70% total power. First is a personal preference for the way the tank looks. I want the front of the tank to look a tiny bit more white than the middle of the tank and I want to reduce the shadows under the rocks and corals toward the front of the tank. At the same time I want the back of the tank to look about as blue as I can make it while still having the V2 at 90% blue and 40% white for midday lighting. It makes the tank look deeper (front to back) similar to when you look off into the distance then you scuba dive or snorkel. BTW, I'm totally happy with the change in the look of the tank. I tried adding a t5 and didn't like that addition at all. There is no ability to dim it and it were too bright. Also trying to getting the right color meant buying more bulbs and then having ones that are almost new, but I don't want. It just wasn't a good fit for me. Second is that I had kept the V2 pulled more toward the front of the tank to reduce the shadows under my rock and coral up front where the shadows are obvious. But that meant that the 5 corals I have growing off the back glass about half way up, weren't getting nearly as much light as they needed. So adding the front bar up front allowed me to move the V2 back to the middle of the tank and the back blue bar lights up the corals on the back glass and makes them pop even at midday. When Reef Breeders gets an assortment of LumenBars to choose from, I'll probably get them and move these strips to a different tank. I'm not crazy about these led strips laying on the euro brace and screen cover. I'd MUCH rather have them hanging off the V2. Although I love that the ones I got have 2 channels and are dimable! Good to know sir...thanks for the reply! I pulled the trigger on the SunBlaster T5 fixtures. They're just too affordable to not give them a try. It still looks sleek from the front, and it *appears* to be giving great coverage over the tank. I'm going to start adding a lot more SPS here shortly, so I'll give these bulbs a few months before I decide if I want the LumenBars instead. Hopefully by then there will be 50/50 acticnic/white options. Does anyone know if 2 T5 bulbs are useless in my endeavor to grow Acro's? My end goal is to have a tank full of Acro's and I thought by adding T5 supplements I'd be able to have a healthier collection of SPS. I also want to bring out better colors with the T5 bulbs. I refuse to swap light fixtures on this tank again, but a T5 fixture with supplement LED's would've been nice from the beginning. Here's a view from the side with the standard bulbs the SunBlasters came with. UPS just dropped off the ATI bulbs I ordered so it'll look different. I'm going to try the True Actinic in the back and a Purple Plus in the front, or maybe the Coral Plus in the front. br88dy, how did you attach the Sun Blaster t5's to the Photon V2? Could you give an explanation and maybe a close up photo or 2 of the mount? Thanks! They look pretty good hanging off the V2. You've done a good job. And they will NOT be useless in your effort to grow sps or even high end acros. The Photon v2 would have done that all by itself! But the t5's will help keep the underside and the deep insides of bigger branching sps colonies more alive. As for coloration, I hear a lot of people here on RC talk about leds not doing as good a job of color development in sps coral when compared to t5. Personally, I don't buy it, and even if it is true, the difference is very minimal. I've been all leds only for about 6 years now and I'd put my corals up against anything I've seen in friends tanks that still use MH, t5 or led/t5 hybrids when it comes to coral color. But now you won't have to even think about the colors because you have it covered both ways. Hey Ron, I know this is an old thread and you probably figured a way to add T5s, but here is my take on it. I basically added two sunblasters using their hanging frame(which is at max $20). The frame is normally for hanging, but for me it just rests on my photonV2. Good thing is that the “teeth” on the frame fits perfectly to the mounting legs, so it looks very nice and it is stable. Down are some pictures, some ideas if you (or anybody that comes to this thread) are still looking for a cheap DIY options.